The slope (or gradient) of a line is a number that denotes the 'steepness' of the line, also commonly called 'rise over run'. Knowledge of relevant formulae is a must for students of Grade 8 and above to solve some of these worksheets. 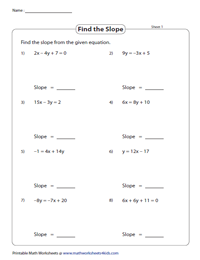 This page consists of exercises like identifying the types of slopes, counting the rise and run; finding the slope using ratio method, slope-intercept formula and two-point formula; drawing lines through coordinates and much more! 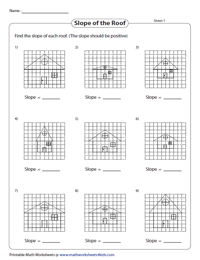 Employ our free worksheets to sample our work. 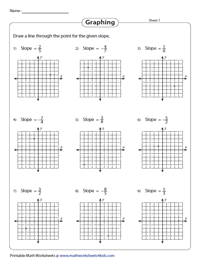 Printing Help - Please do not print slope worksheets directly from the browser. Kindly download them and print. Based on the position of the line on the graph identify the type of slope - whether positive, negative, zero or undefined. 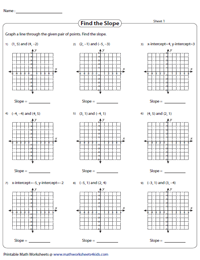 The first part of worksheets require students to plot the points on the graph, draw the line and identify the type of slope. In the next section, draw a line through the single-point plotted on the graph to represent the type of slope mentioned. Based on the two points plotted on a graph, calculate the rise and run to find the slope of the line in the first level of worksheets. 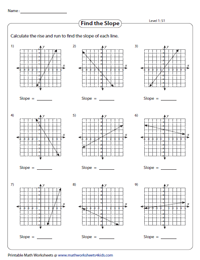 Find the rise and run between any two x- and y- coordinates on the line provided in the second level of worksheets. Each graph is represented with roofs of various sizes. Find the slope of the roof for each house. Answers must be in the form of positive slopes. Click on the 'Download the set' option to access all worksheets in this section. 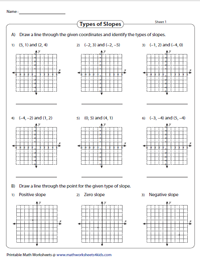 Draw a line through a single point plotted on the graph based on the slope provided in this set of worksheets. Use the x- and y- coordinates provided to find the slope (rise and run) of a line using the ratio method. A worked out example along with the formula is displayed at the top of each worksheet for easy reference. 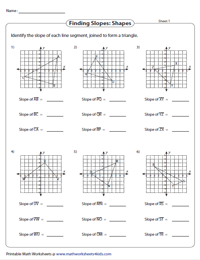 Triangles are represented on each graph in this assembly of worksheets. Learners will need to identify the rise and run for each of the three line segments that are joined to form a triangle. Plot the points on the graph based on the x- and y-coordinates provided. Then, find the slope of each line, so derived. Some problems contain x- and y-intercepts as well. Employ the two-point formula that is featured atop every worksheet along with a worked out example. Substitute each pair of x- and y- coordinates in the given formula to find the slope of a line. 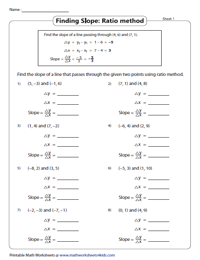 In this series of worksheets, the slope and the co-ordinates are provided. Use the slope formula to find the missing coordinate. This set of worksheets features linear equations. 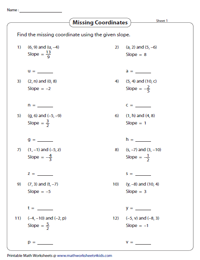 Students are required to find the slopes by writing linear equations in slope-intercept form.